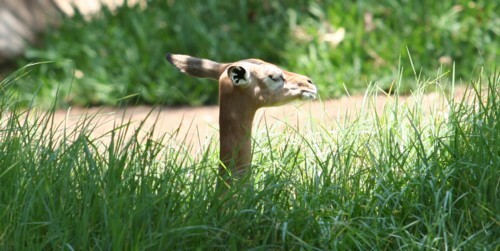 The Gerenuk (Litocranius walleri) is an antelope, also called the giraffe gazelle, found in East Africa. The origin of the name is believed to be from a Somali name for 'giraffe-necked'. The animal can weigh up to 52 kilograms and stand over 1 meter in shoulder height. It is capable of standing upright on its hind legs. When upright, it can reach a height of 7 feet. Only the males have short, thick, lyre-shaped horns up to 17 inches long. The coat is fox red on the back, lighter on the flanks and white on the underparts. During mating season, the male's neck can swell significantly. The gestation for females is 6.5 to 7 months and they reproduce at an 8-9 months interval. They are very shy and ready to run away with their heads held horizontally forward, so they can pass under low branches with ease. The animal usually lives in small herds of 3-10 others. 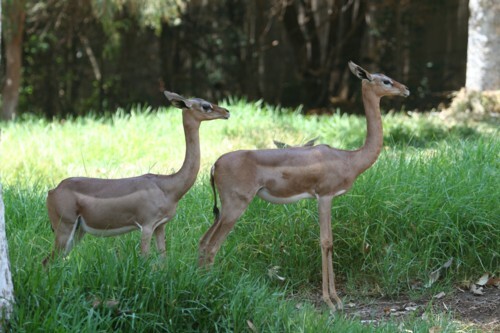 Unlike other antelopes, gerenuks do not eat low-lying vegetation, but rather stand on their hind legs and use their long necks to reach the leaves in trees. Their long necks have evolved due to the advantage of being able to reach higher vegetation to feed selectively on leaves, shoots, flowers and fruits of the thorn trees and bushes that dominate arid lowlands. They are known to virtually never drink and depend on evergreen shrubs, bushes, and trees during an 8-months dry season. Best places to see them in Kenya are the Tsavo and Meru National Parks and also Samburu-Isiolo National Reserve.